Do you remember the first time you tried to bake chocolate chip cookies? Even though you followed the recipe on the back of that yellow package, probably something went wrong. The butter was too hard, so it didn't mix right. (Or too soft, so the cookies spread out on the sheet too much.) You may have placed the cookies too close together on the sheet, so they all became one big blob that you couldn't get off the pan. Maybe you didn't have baking powder, so substituted baking soda instead, with weird results. Or maybe your oven isn't calibrated right, so the cookies came out burned or undercooked. Anyway, the point is that even though you followed the recipe, there is enough leeway in there that you still need to learn a few things about how it really works. It's pretty similar with training plans. You can print out any plan from the internet or a running magazine, or even get a custom plan from a coach, but until you go through it and see how your body reacts to it, it's hard to know how you'll respond to it. Most of the time, too, you'll make some little changes to any plan - I, for example, do a lot of my speed work on a treadmill - and all of the changes you make can affect a training plan's efficacy for better or worse. Are you cooling off enough between intervals? It the hill you've chosen to run hill repeats on too steep, or not steep enough? Does the schedule that your plan has you running allow enough recovery time for your body? Most of these variables can only be figured out for yourself by trial and error. The training plan that I'm using right now is one from Outside Magazine, and it's tailored to help you run a 1:30 half marathon. It took me three tries, and four total cycles through the plan, before I made that goal. Each time I went through the plan, I tweaked it a little bit, until eventually I think I have it in a pretty good place for me. 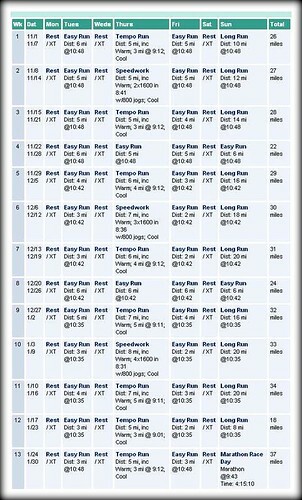 When I needed a training plan for my fall marathons this year, I simply modified the half plan to include longer weekend runs, and to include some longer tempo and speed work during the week. So far it's working well for me; we'll see how it does this fall. So go out and find a training plan for whatever race you're looking at. But pay attention to how your body reacts to the different workouts, and don't be afraid to change things around a bit to better suit you. And then, after all that working out, go make some cookies.